Call the Fire Department at (440) 774-3211. It can usually be available for pickup, faxed to you, or sent via regular mail. Copies to residents are free of charge. Requests from business or insurance agencies are $2.00 per report. How can I become an Oberlin Part-time Firefighter? You can contact the City of Oberlin Human Resources office at (440) 775-1531, or view the information at Employment. What types of fire safety programs does the Fire Department offer? You may visit our Fire Safety Programs page on our website or call (440) 774-3211. If my child is playing with fire, can I obtain counselling? Yes, visit our Firesetters page for information or call (440) 774-3211. How do I get a fire permit for professional fireworks? Visit our Permit page on our website or call (440) 774-3211. Do you get cats out of trees or rescue other animals? It depends on the situation. Provided that there is no unsafe conditions and that the owner of the cat is present to accept liability should one of our personnel become bitten or scratched and require medical treatment, an animal rescue may be performed. We strongly suggest to try opening a can of tuna (this usually works), leave the immediate area and wait for the cat to get down on its own. We generally do not rescue stray animals due to their unknown medical condition (i.e., rabies, distemper, etc.). The Fire Department does carry emergency life-saving equipment for house pets involved in smoke/fire situations. At the fire station between the hours of 8 a.m. and 5 p.m.
Where can I find out more information about Emergency Medical Technician Courses? Local classes for EMS First Responder, EMT-Basic, EMT-Intermediate, and EMT-paramedic are often taught at two locations regularly. Lorain County Community College and the Lorain County JVS (800) 774-1051. CPR is taught by the American Heart Association or the American Red Cross. Courses can be provided by the Fire Department on request. How can I schedule a fire truck or Sparky the Fire Dog at my function? Call the Fire Department at (440) 774-3211 to inquire. Who do I call about a fire extinguisher that doesn’t work or needs service? The Fire Department does not service nor inspect fire extinguishers. Check the Yellow Pages under Fire Extinguisher or Fire Extinguishing Systems for a service contractor. Ohio law requires all drivers to pull to the right side of the road and stop. This allows fire apparatus adequate and clear lanes to safely and quickly continue its response. I have noticed a “white light” at an intersection when fire trucks are approaching, what is this? This is a signal that an emergency vehicle is approaching and has activated a traffic control system (Opticom) which systematically and safely changes the traffic signal to provide a “green” light for approaching emergency vehicles. The system is usually set so that the signal is received well in advance of the emergency vehicle’s arrival. And it does systematically cycle through and just doesn’t change opposing traffic’s signal without warning. This allows the intersection to clear and helps improve the responses to emergencies through intersections. Fire Department units are dispatched according to information received by the 9-1-1 operator. 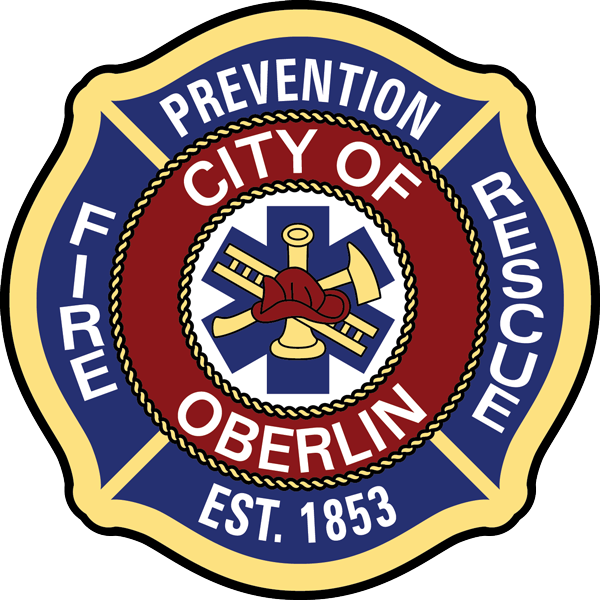 The Oberlin Fire Department thinks overcautiously when they respond to citizens in need of help. In other words, the firefighters are prepared to deal with the worst that could happen. Discovering that we need more units once we arrive is often too late. We have learned from experience that its better to have too more help on the way than not enough. A structure fire requires a number of firefighter and various equipment to do all the assigned tasks. Firefighting teams are assigned certain responsibilities such as fire extinguishment, search and rescue, ventilation, salvage, safety, accountability and rapid intervention teams when firefighters become trapped or injured. Why do I see fire trucks with red lights and sirens pass through a red light at intersections and then, after they go through, they turn off their lights and slow down? As explained in the previous answer, sometimes several units are dispatched to the same incident. The first unit may have arrived on the scene, assessed the situation and informed the dispatcher that the situation was under control or that a single unit could handle the emergency. All other responding units were cancelled and put back into service, ready to take another call. Most likely, when you see an emergency vehicle with red lights and siren through an intersection and then slow down and turn the emergency lights off, they have been cancelled from the call they were responding to. This is called “venting the roof.” There are two basic reasons for this practice. Dangerous gases and dark smoke accumulate in a burning building. Unlike the movie versions of fires, it is impossible for firefighters to see in such an environment. When a hole is made in the roof because the building is “vented,” the smoke and gases escape because heat and smoke rise. It makes it much easier for the firefighters in the building to see. It also reduces the possibilities of backdraft (explosion) and flashover. Another reason for venting the roof is to see how far the fire has progressed. One of the fastest avenues through which fires spread is the attic. Heat and smoke rise into the attic where the fire can move quickly. Firefighters may go ahead of the fire on a roof, cut holes to access the attic and stop the fire from spreading through the attic. Why do firefighters break building windows during a fire? Two reasons. First, automobile accidents present other hazards such as potential fire, ruptured fuel tanks, and/or the presence of hazardous materials. Second, firefighters are trained Emergency Medical Technicians (EMTs). Therefore they can provide patient care or assist in extricating (removing) trapped occupants of the vehicle. Why do fire trucks respond to emergency medical calls instead of ambulances? As mentioned in the prior statement, all firefighters are cross-trained as EMT’s. Our primary mission is to provide supplementary support to our local ambulances. With a strategically located fire station and personnel on duty, we can often arrive prior to the ambulance and begin life saving techniques such as CPR or cardiac defibrillation. Ambulance transport service in the Oberlin area is provided by the Central Lorain County Joint Ambulance Authority. See firefighter employment information on the Fire Department’s website. Most Oberlin full-time firefighters are hired from our Part-time firefighter ranks. The Oberlin Fire Department does not remove bees unless there is imminent danger to a person. To have bees removed, check the Yellow Pages under Beekeepers.